Beautiful remodeled house on Ford Lake. Some of the best inland fishing you will find on this side of the State. 120 foot of lake frontage with dock for two boats and swim raft. Property has enclosed fire ring and is slightly wooded for privacy. This is a spacious, wonderful place for that perfect family vacation. Bedrooms are located upstairs with 2 Queen beds and 1 Double bed. Ford Lake is a short 25 minute drive from Ludington and Lake Michigan, or a 30 minute drive from the Victorian port city of Manistee. 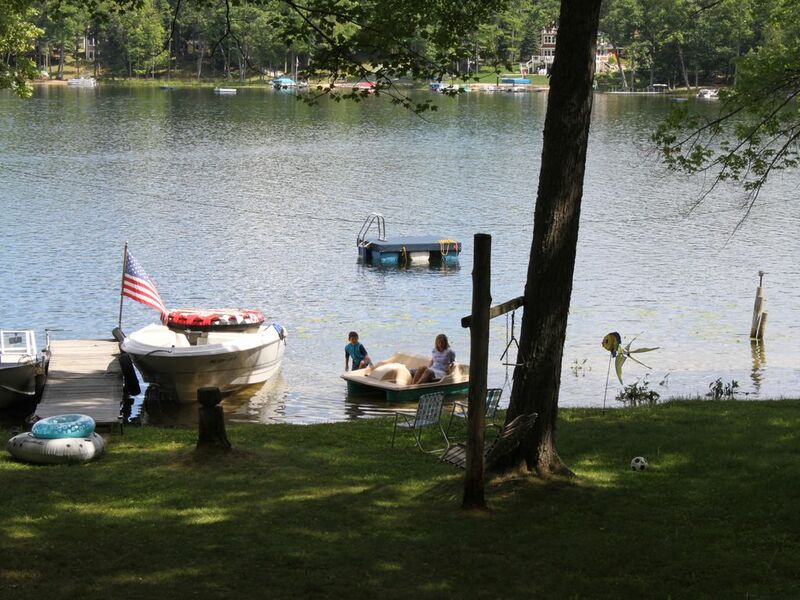 Ford Lake is the perfect size, 208 acres, for enjoying all water activities. Early risers can enjoy coffee on the large deck while listening to the Loons in the morning. Do you enjoy a nice morning run or jog? The trip around the lake on foot is approximately 3.2 miles. Celebrating a special occasion? Let us know and we can help make your stay even more special! Special services include but are not limited to: Birthday cakes, special flower arrangements, BBQ catering and much more. Don't want to waste your first few hours grocery shopping? We can do that for you too! I grew up in Ludington/Scottville and have been active in local government from an early age when my father was president of the Chamber of Commerce. I attended Central Michigan University and graduated with my Bachelors' degree in education. I taught for 8 years and have since went back to my roots in retail management. I have a wonderful family with a son, two daughters, and my beautiful wife. I am truly blessed. This property was originally purchased by my grandfather and has been in the family ever since. Recently we decided to remodel the house and start utilizing vacation rentals to help pay for expenses for the property. This is more than just a cottage, this was my grandparents' primary home and after they passed my parents and I lived here for 5 years. It is away from the city but still close enough to everything to be able to truly enjoy your vacation. 22' ft Pontoon available for rent. Our family had a wonderful time vacationing at this beautiful home. Plenty of space for our entire family indoors and out, including our dog. The home was completely stocked; really, all you need is food, sunscreen and clothing. An abundance of supplies were available…a very nice surprise. Having the washer and dryer to wash bathing suits & towels was extremely helpful. It is a quiet and peaceful setting with wonderful, friendly neighbors. We rented the pontoon boat so my husband was able to spend his time fishing. We spent every day down at the lake. My daughters and I enjoyed the swim platform and kayaks, and my Mother-in-law loved the paddle boat. Our dog had a blast swimming in the lake as well. A nice fire pit is well positioned on the large shaded lot, with plenty of firewood for nightly bonfires. Every vacation has it’s hiccups, but ours were not the fault of the fabulous owner. We were locked out for the first 2 hours of our vacation upon arriving…the cleaning crew took the key. And the pontoon boat was not working properly for 3 1/2 days, so we lost some fun boating and tubing time, but Ryan fixed it as soon as he could and provided a full can of gas. I highly recommend this lovely home for a relaxing vacation. I would love to return!!! We stayed a week at this cottage in early August. The cottage had a true cottage feel like what I grew up with. The inside of the cottage was clean and well supplied, we truly did not need to bring anything with us. The kitchen had everything we needed plus more, the washer and dryer was useful and there was plenty of seating in the downstairs area including two couches that folded down into beds. What I was not expecting was the shotgun bedrooms upstairs, where you walk through all of the bedrooms to get to the last one and so on. I didn't like the lack of privacy with that which I'm sure would be fine if you have a family with children renting the cottage but we were all adults so it was kind of weird. The outside was not as well taken care of. The deck was really nice, the fire pit area was good also. There was a shed out back that had fallen in and everything was piled up outside in the elements that was quite an eyesore. The neighborhood was quiet as was the activity on the lake. The cottage was very convenient to Ludington and Manistee when we wanted to take an afternoon trip. My husband spent a lot of time on the lake fishing. The couple that we rented the cottage from were very nice and met us at the cottage and did a walk through with us that was helpful. We did enjoy our stay and I would recommend the cottage but I hope they have someone take a little better care of the outside. We stayed a week on this property and enjoyed the lake every day. If we were not on the water boating, the kids enjoyed looking in the water off the dock at the turtles and fish. The home had a nice supply of linens and towels. Being able to wash swim suits and towels mid week was priceless after so much time in the water. The lower level was roomy and except for when everyone was in the kitchen at once the downstairs felt big enough for the family. The bedrooms on the upper level had some narrow stairs to climb and was a set up in the older style footprint of connecting rooms. But this was not unmanageable and everyone slept well. Over all a great trip. The family we rented from was very accommodating. Looking forward to next year! We had a delightful time at your cottage - it was extremely clean, nicely appointed and was stocked with everything imaginable to make our stay carefree and relaxing! We were especially happy that the property was pet friendly, the hill from the cottage to the lake was well traveled -- not only by the dogs, but the grandchildren also. We ate out on the beautiful deck every meal (except for one rain day), and admired the patio set, lake and surroundings constantly. Most days were spent jumping off the dock, and the diving platform and of course the paddle boat. Also appreciated was the modern bathroom & tub as well as the bedding -- it was so comfortable with the firm mattresses & soft linens. Another favorite spot was the front sun room that led to the deck. A small drawback was the distance to Ludington, so we frequented the little store that was 3 miles away. The grounds were neatly maintained and we enjoyed the perrennials scattered about. All in all, a good and relaxing time was had by all. We loved our time at this cottage! It was a much needed week of quiet, peaceful relaxation on this beautiful lake. We enjoyed the pedal boat, floating dock and deck with patio furniture to eat family dinners on. We rented the pontoon boat also and enjoyed the trips around the lake and the fishing! Everything was very clean and they provided everything you need. Just bring your food and clothes. Location was great for long walks and bike rides around the lake. It is a good 25 miles to Ludington but we didn't mind bc we were glad to be away from the busyness of that area. Would highly recommend this cottage and we will definitely be back for another visit sometime soon. Perfectly quaint and quiet getaway! My family with four kids and a chocolate lab stayed at this very simple, very clean home in July of this year. We enjoyed the dock and swim platform....a lot!!! The kids spent the day paddling out there on the little paddle boat...or swimming out there and laying out, jumping off etc. Much time was spent catching minnows at waters edge too....or trying. In the evening, we grilled out each night and played horseshoes while watching the sun set from the beautiful large deck overlooking the water....while the bonfire was going off to the side! It was incredibly peaceful there! The home itself had plenty of sleep room, and was very clean and had all the paper product and cleaning supplies if needed.....really nicely stocked. Towels and sheets were also provided, and no washing was required. We look forward to booking this rental next year as well. Very close to Ludington and lake Michigan....20/25 minute ride. Lovely and such nice owners too! They left directions to local eateries and grocers, etc inside the home for us. All good! Highly recommended! Thank you for your kind words! This was a wonderful summer for us and we greatly appreciate all the guests that were able to stay at our home. The best thing about renting our house is that all proceeds go into home improvements, so every year we hope to make the place better. We can't wait to have you stay with us again! a 50% cancellation fee will be assesed if reservation is canceled less than 30 days prior to stay All rentals are Saturday to Saturday no exceptions will be made.